Continuing my series of the new kind of Professional Development Series for Teachers, this post will highlight the Academic Coaches (TOSA’s) that are our unsung heroes. These professionals are pulled out of the classroom, generally in a full-time capacity, and offered an opportunity to coach classroom teachers in their pedagogy and delivery of classroom instruction. Quite often, these professionals do not receive dedicated professional development. In our modern education environment, & it has become critical for all educators to embrace and use technology almost on a daily basis. Yet, TOSA’s often receive no exposure and/or dedicated professional development on the topic of technology integration. Once Dublin got through the big professional development and the classrooms were loaded with students and stuff, it was time to focus my attention on the Academic Coaches. In a partnership with the Director of Curriculum and Instruction, Dr. Sarah Breed, we out outlined a very aggressive professional development plan for the Academic Coaches and Dublin Unified. Weekly targeted professional development is being delivered to Academic Coaches on two basic topics: the full integration of Google Apps for Education and it’s a daily use with students and staff. And modern thinking on apps and extensions to ease efforts of classroom teachers and the ongoing needs of TOSA’s to be everywhere at once. Our first session had a heavy focus on Google classroom as one of our delivery mechanisms for instruction in 2015-2016. I also introduced them to the broader community of TOSA’s via CUE Rockstar and targeted Twitter chats that met their needs in there very specialized positions for their PLN’s (personal learning networks). This exposure proved to be much needed as some of the TOSA’s in our district have since begun to participate in weekly chats on Twitter fine-tuning their own skill sets. Some of our coaches in their roles were brand-new to the district so we also focused on Hyper Docs” created by a Pleasanton Unified team of high-profile Coaches: Lisa Highfill (@lhighfill), Kelly Hilton (@KellyiHilton) and Sarah Landis (@SarahLandis). I shared that there had been a focus in spring collaboration meetings at the elementary level and secondary level utilizing hyper docs in daily instruction. 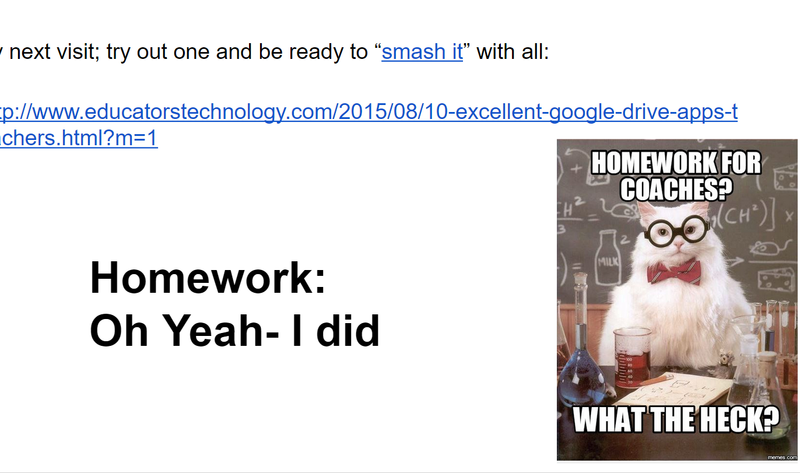 That along with google classroom felt like it was more than enough as a kicking off place. You will notice while viewing the slide deck: Coaches Deep Dive, that we also spent time on iPads as a delivery mechanism in coaching teachers in the classroom. For coaches that travel around to multiple sites, lugging a large laptop is not always ideal. APPs were introduced by the Coaches in a very dynamic APP smash that allowed them to share with one another, tools they used on a daily basis that could help them as a team overall. In the Google Classroom professional development course created (and mentioned in a prior series post) they have all been added as teachers. Some of the Academic Coaches have also created classrooms and invited other Academic Coaches to participate as students. This gives our Academic Coaches an invaluable lens of the Google classroom experience for both a classroom teacher/student. Complimenting the technology, I provide them with readings from online sites that are the best of what is offered in research for technology integration. We are not spending time learning new models, nor are we spending time attempting to master said models. Rather my approach is to take the Coaches directly to the tools that will be used by themselves they can share with classroom teachers during collaboration time. I believe that is a more effective model to learning technology integration. When meeting with grade level teams or departments: the Academic Coaches are charged with integrating some of these tools in their own delivery. Our next professional development topic will be video in the classroom. The Academic Coaches will learn one to two video recording tools that they in turn will make available to classroom teachers so that they can begin to use video with students. If all goes well with my master plan for technology integration and TOSA’s, our district will be well prepared for full technology integration in every classroom in a meaningful way. Stay tuned for progress on my thinking through the school year.